The Rohtas Fort is constructed on a plateau over the top of a hill with steeply rising sides. The steps directing to the fort are cut into limestone of the hill. In the past, many streams crossed the plateau and the soil was productive, which helped in easy growth of the crops, so that the inhabitants of the fort could hold out for months against any enemy besieging the fort. Thick forests and wild animals surrounded the hill providing natural barriers and dacoits provided other man-made barriers in the past. Thus the fort which was believed to be invincible, could not be taken by force but only by means of deceit. It takes around two hours from the district headquarters at Sasaram to reach the foot of the hill over which is the Rohtas Fort. The fort is situated at about 1500 feet above sea level. There are about 2000 odd limestone steps at Medha Ghat meant for the most common mode of ascent to the fort on foot at present. For the visitor they are an exhausting climb of an hour and a half. At the end of the climb, one reaches the boundary wall of the fort. A lovely waterfall is seen during the rains, which falls over the fortifications, and is mesmerizing to watch and hear from a distance. A dilapidated gate with a cupola can be seen, which is first of several provided for well-guarded entrances to the fort. From here one has to walk another mile or so before the ruins of Rohtas can be seen. In the Harivamsa Purana it is stated that Rohita, the son of Harishchandra, had Rohitpura constructed with a view of consummation of his dominion (Buchanan, Appendix C). Even though the Fort is ascribed to have been constructed by the legendary Rohitaswa, son of the great King Harish Chandra, there are no historical remains to corroborate the existence of early kings on the fort. The oldest historical record found on the fort is an inscription which is ascribed to the 7th century, thereby implying the existence of the rule of Sasanka in the 7th century over Rohtas. The only records of Hindu times connected with Rohtasgarh are a few rock cut inscriptions at various places on the plateau. The first at Phulwari, dates back to 1169 AD, and refers to the construction of a road up the hill by Pratapdhavala, theNayak of Japila. Japila is evidently the modern Japla, on the opposite side of the Sone, in the district of Palamu; and Pratapdhaval appears to have been a local chief, who is also known from the inscrioptions at Tarachandi near Sasaram and at Tutla Bhawani near Tilothu. From another inscription at Rohtas, Pratapdhawal is referred to belong to the Khayaravalavansha, which survives in the present day as the tribe of Kharwars. The only other record of Hindu Rule over the Fort is an inscription atLal Darwaza, dated 1223 AD, which mentions a descendant and successor of Pratapdhavala, calle/d him like Pratapa. 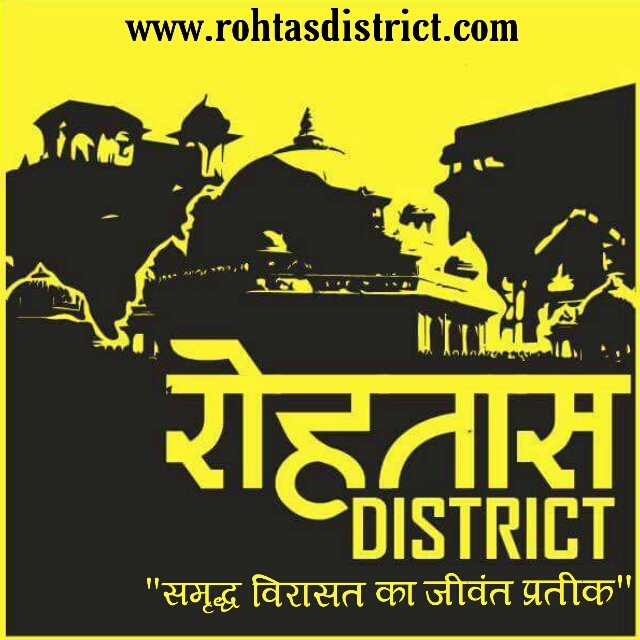 The history of Rohtas is a long and chequered one. The old texts and inscriptions found near Rohtas suggest that the fort was in the possession of the Hindu king Pratapdhavala of the Japala dynasty. Other inscriptions cite that it was ruled by the Khayarwala clan who were sovereigns of Shahabad (the area now includes Bhojpur, Buxar, Kaimur and Rohtas). The Hindu kings of Rohtas constructed a road through the jungle leading from the foothill to the plateau, did the fortifications on the jungle roads and the four gates on the four ghats. The main fortifications at the Raja Ghat and the Katauthiya Ghat can still be seen. Except from the matrix for making seals belonging to the 7th century AD king Sasanka, all other artifacts are from the time of Sher Shah Suri and onwards. In 1539 AD, the Fort of Rohtas passed out of the hands of the Hindu kings into those of Sher Shah Suri. She Shah Suri had just lost the Fort at Chunar in a fight with the Mughal emperor Humayun and was desperate to gain a foothold for himself. Sher Shah requested the ruler of Rohtas that he wanted to leave his women, children and treasure in the safety of the fort, while he was away fighting in Bengal. The king agreed and the first few palanquins had women and children. But the later ones contained fierce Afghan soldiers, who captured Rohtas and forced the Hindu king to flee. Buchanan mentions that the Fort belonged to a hindu Brahmin Raja, Chandra Ban, when it was wrested by Sher Shah. During the reign of Sher Shah, 10000-armed men guarded the fort. Haibat Khan, a trustworthy soldier of Sher Shah built the Jami Masjid in 1543 AD, which lies to the west of the fort. It is made of white sandstone and comprises of three domes. There is a mausoleum of Habsh Khan, the daroga or the Superintendent of works of Sher Shah. Rohtas Fort under Raja Man Singh :- In 1558 AD, Raja Man Singh, Akbar’s Hindu General, ruled Rohtas. As the Governor of Bengal and Bihar, he made Rohtas his headquarters in view of its inaccessibility and other natural defenses. He built a splendid palace for himself, renovated the rest of the fort, cleared up the ponds and made gardens in Persian style. The palace was constructed in a north-south axis, with its entrance to the west with barracks for soldiers in front. The fort is still in a fairly good condition. Rohtas during later Mughals :- After the death of Man Singh, the fort came under the jurisdiction of the office of the Emperor’s wazir from where the governors were appointed. In 1621 AD, the Prince Khurram revolted against his father Jahangir and took refuge at Rohtas. The guardian of the fort, Saiyyad Mubarak handed over the keys of Rohtas to the prince. Khurram once again came to Rohtas for safety when he tried to win Avadh, but lost the battle of Kampat. His son Murad Baksh was born to his wife Mumtaz Mahal. During Aurangzeb’s reign the fort was used as a detention camp for those under trial and housing prisoners sentenced for life. Rohtas in British times :- In 1763 AD, in the Battle of Udhwa Nala, the Nawab of Bihar and Bengal, Mir Kasim, lost to the British and fled with his family to Rohtas. But he was not able to hide at the fort. Finally the Diwan of Rohtas, Shahmal handed it over to the British Captain Goddard. During his two-month stay at the fort, the Captain destroyed the storeroom and many of the fortifications. Goddard left, keeping some guards in charge of the fort, but they too left after a year. There was peace at the fort for the next 100 years or so, which was at last broken at the time of the First War of independence in 1857. Amar Singh, the brother of Kunwar Singh, together with his companions took refuge here. There were many encounters with the British where the latter were at a disadvantage, for the jungles and the tribals in them were of great help to the Indian soldiers. Finally, after a long drawn out military blockade and many clashes, the British overcame the Indians. The Fort thereafter lied neglected and was forgotten by the mainstream tourists. Hathiya Pol :- The main gate is known as the Hathiya Pol or the Elephant Gate, named after the number of figures of the elephants, which decorate it. It is the largest of the gates and was made in 1597 AD. Aina Mahal :- The Aina Mahal, the palace of the chief wife of Man Singh, is in the middle of the palace. Takhte Badshahi :- The most expansive structure within the palace is however theTakhte Badshahi, where Man Singh himself resided. It is a four-storied building, with a cupola on top. There is an assembly hall in the second floor and a gallery resting on strong, engraved stone pillars. The third floor has a tiny cupola, which opens into the women’ quarters. From the fourth floor one can get a bird’s eye view of the surrounding area. Baradari :- The residential quarters of Man Singh were on the first floor, which was connected to the ladies’ rooms via a gateway in the east. An assembly hall, probably the Diwan-i-Khas or the hall of private audience is a little towards the west of Baradari or the hall of public audience. The hall is decorated with etchings of flowers and leaves, and lies on similarly decorated pillars. Outside the palace grounds are the buildings of Jami Masjid, Habsh Khan’s Mausoleum and the Makbara of Shufi Sultan. The beautiful stucco style, with the cupola resting on pillars reminds of the Rajputana style where the domed structures are known as chhatris. This style had not been used in Bengal and Bihar earlier but its emergence at Rohtas was not surprising as more than half the fort’s guardians came from Rajputana. Ganesh Temple :- About a distance of half a kilometer to the west of Man Singh’s Palace is a Ganesh temple. The sanctum of the temple faces two porch-ways. The tall imposing superstructure corresponds to the temples of Rajputana (Rajashtan), especially of Ossian near Jodhpur built in the 8th century AD and the Mira Bai temple of the 17th century AD at Chittor. Hanging House or Fansi Ghar :- Further towards west, some construction must have taken place although there is no written evidence of what it was. The locals call it the Hanging House, as the fall from here is a straight 1500 ft down with no obstacles on the way. Locals have a story to tell about this place that this spot is the mouth of a cave, where a Muslim fakir (mendicant) is buried. It is said that he was thrown from here into the valley three times. In spite of being bound hand and foot, the fakir escaped unhurt each time. Ultimately he was buried in the cave. Rohtasan or Chaurasan Temple :- About a mile to the northeast of the Palace are the ruins of two temples. One is the Rohtasan, a temple of Lord Shiva. Iconoclasts probably destroyed the roof and the main mandap, which housed the sacred lingam. Now only 84 steps are left, which lead to the temple believed to be in existence since the times of the Great Puranic King Harishchandra. The domes crest the Devi Mandir. The idol of the deity was missing from here, though the rest of the building is in good condition. Singh Dwar :- The Singh Dwar is the main gate of the Fort and is located at a distance of about 6 kms from the Fort Palace. This is the only jeepable ascent to the Fort Palace. The Ghat is called Kathautea Ghat, owing to the peculiar shape which resembles a container. The access from this point is very narrow with deep valleys on both sides of the small connecting road. It is also very picturesque.